What Makes A Race Car Faster? A Fiero Wing, Of Course! 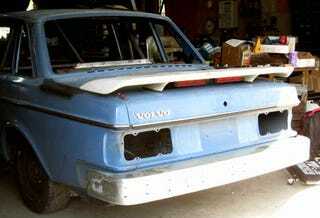 When we added a great big hood scoop to our V8 Volvo LeMons racer, it immediately became apparent that something was missing from the picture. But what? Walking around to the rear of the car, it hit us: we lacked a wing! Skeptics might point out that a wing would be aerodynamically meaningless on a brick-shaped car running on a track with top speeds of about 60 (the crueler skeptics might even refer to a wing as "useless dead weight"), but we know that's hogwash- the bigger the wing, the faster the car! With Half Price Day coming up at the junkyard, we had to select our wing carefully; after all, $9.00 is quite an investment. We considered going for an MR2 wing, but some quick measuring led to the discovery that the wing off the Pontiac Fiero GT was just the right width for our car. Into the Civic with the other half-priced loot! The Fiero GT wing is especially nice because it mounts on any flat surface via four easily-drilled holes. Because we wanted to try to get some test time at a track with a "No Brake Light, No Service" policy prior to the actual race, we picked up some Chrysler minivan brake lights to mount on the underside of the wing. By our calculations, our Fiero wing adds 50 horsepower and infinite coolness.